I’ve had a love hate relationship with my outdoor teak furniture for the last 3 years. I’m loving it now of course, since all the work is done. To me, all outdoor wood furniture is gorgeous when it’s new or is fresh from an outdoor makeover. My goal is to keep my furniture good looking as long as possible, years even. 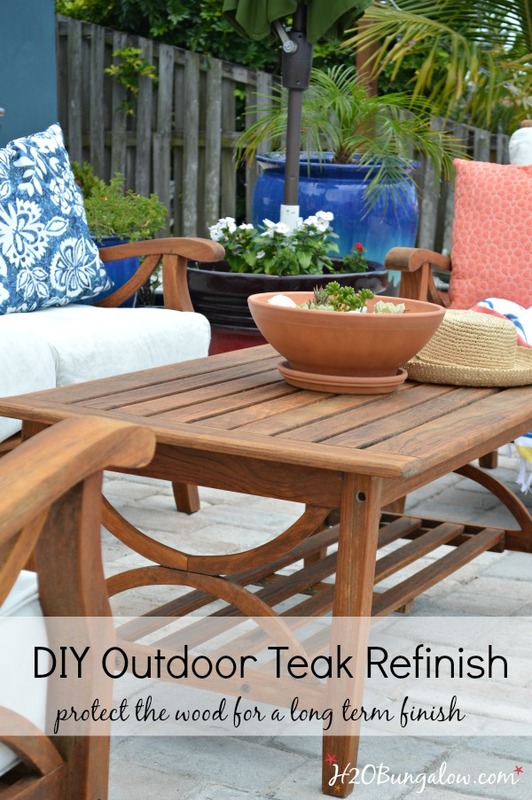 Today I’m sharing my tips and tricks to restore outdoor teak furniture to save time and make the finish last longer for those of you who live with the same love/hate dilemma of outdoor wood furniture. You guys may remember I shared this picture a few weeks back. 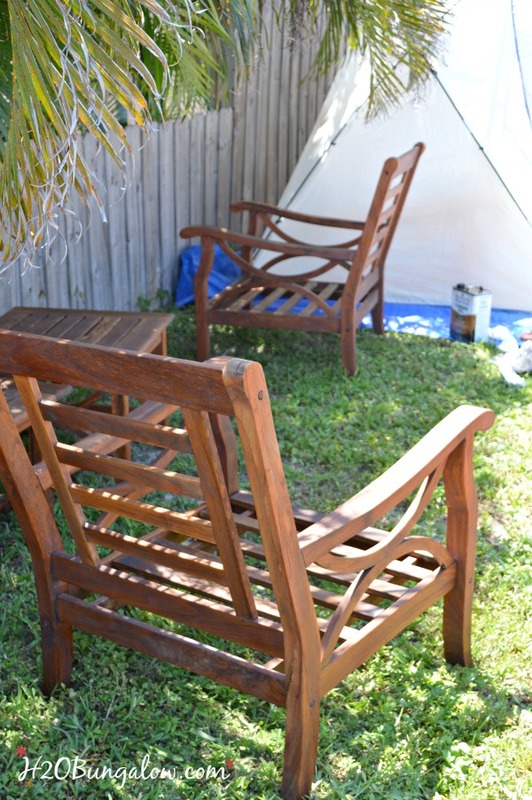 It’s my backyard and teak furniture before I started my 30 Days To Fabulous Backyard Makeover in the beginning of June. Fast forward a few weeks and several DIY projects later. I had to buck up and just do it. It was time to restore my outdoor teak furniture. But I wasn’t going to do what I did last time. I used plain teak oil on our teak furniture twice the first summer we had it. Each time it looked good for a few weeks and then faded again. What the heck? All that work for a few measly weeks of looking good? Then I kind of gave up and decided I’d go for the weathered look. That spot below is where the cushion protected the wood and what it looked like 3 years ago. 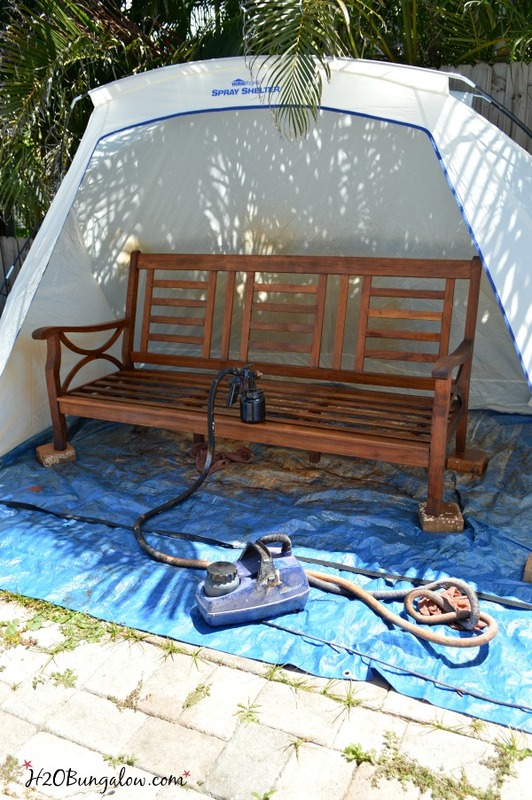 Supplies needed to restore outdoor teak furniture or outdoor wood furniture. 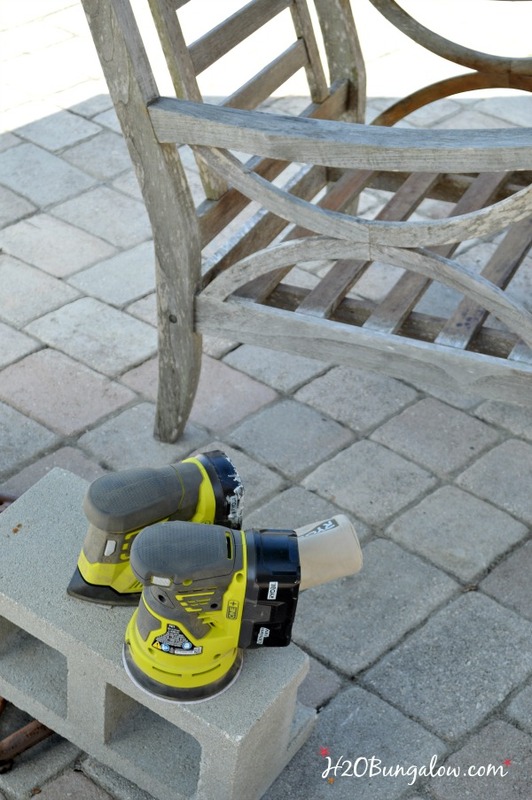 Start by sanding down the weathered areas of the wood to expose a fresh surface. My 5′ orbital sander was the perfect size and power to remove the top layer of damaged wood quickly. It worked best on horizontal surfaces. The hand sander was perfect on horizontal surfaces and corners. 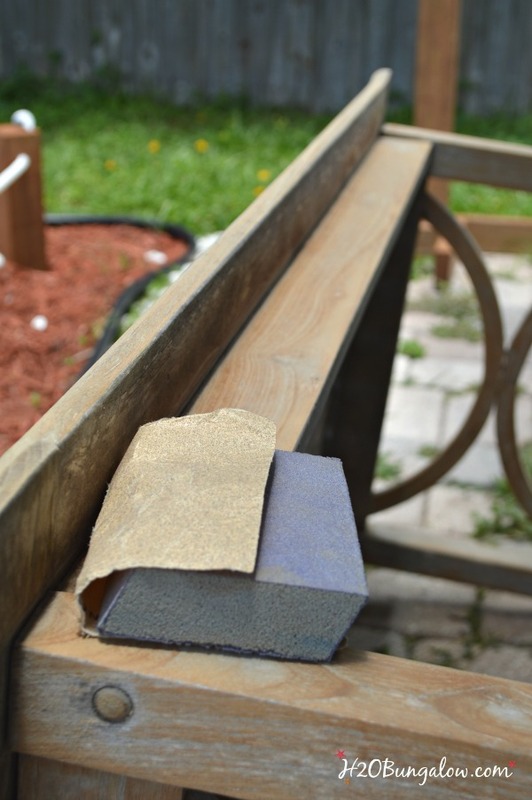 A piece of sandpaper wrapped round a sanding block is a good way to get hard to reach places like in between slats and decorative areas. Look at the grain in that wood! I’d love a piece of teak indoor furniture like this. I’d keep the wood bare just like it is now. But I can’t do that outside , so onward with restoring outdoor teak furniture I went. 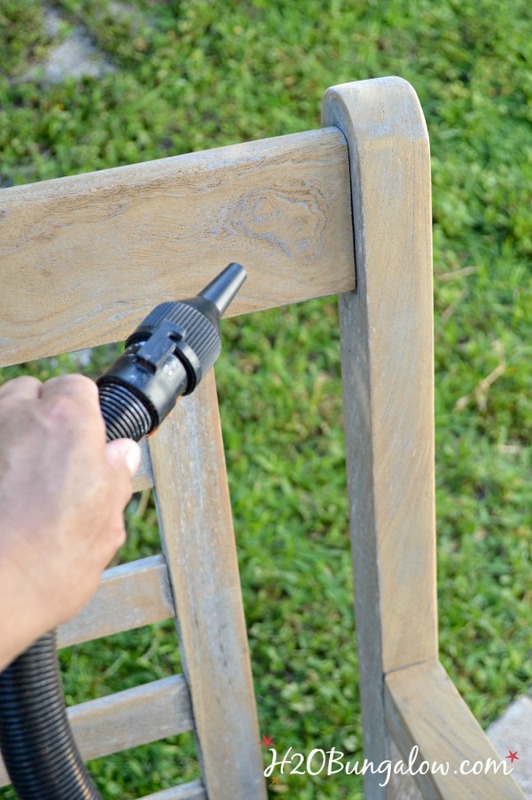 It’s important to have a clean and dust free surface before refinishing teak wood or any outdoor wood. Sawdust was everywhere after sanding down the teak wood. On me, the furniture, in cracks and crevices. The easiest way to clean it all off was to use the air hose and attachment on my Finish Max Pro Paint Sprayer. It has a powerful blast of air that took care of most of the dust. I gave each piece a once over with a clean painters rag to remove any last bit of dust left. If I didn’t own a Finish Max Pro Paint Sprayer and Paint Shelter already, I’d buy them for this project. 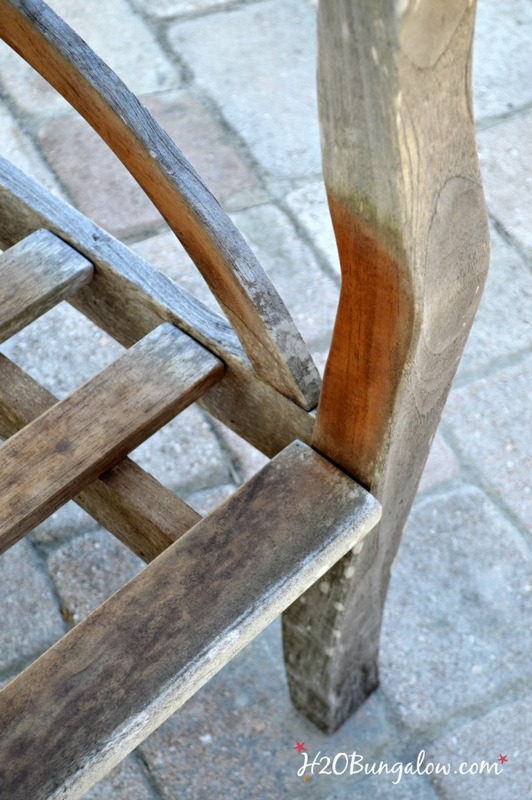 When refinishing outdoor teak or any wood furniture for that matter, you can’t get around prepping the wood properly. Using the right tools simply makes that step easier and less painful. The step that can really save time and a huge amount of effort is how the teak oil or refinishing product is applied. It took hours to apply teak oil by hand. Using my Finish Max Pro Paint Sprayer I applied an even coat all over in minutes, wiped off the excess, and moved on to the next piece. A chair took less than 10 minutes start to finish. Less than 10 minutes guys! I love my Paint Shelter for lots of projects. It protects the surrounding area from overspray and the painted surface from dust and wind while I’m painting. It’s also a good shelter from the sun if I’m working outside. The Paint Shelter assembles like a camping tent and can be put up in a few minutes. Want a closer look? Here’s a post with a video I shared a while back showing how to assemble a Paint Shelter. To apply the Timber Oil I started on the underside of my furniture. I like to elevate my furniture on wood blocks , or whatever is handy. 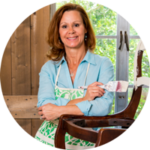 I share a good video and tutorial on using the Finish Max Pro Paint Sprayer here. You’ll also see the difference having a Paint Shelter can make, I didn’t have one when I was working on that project. To get the proper amount of Timber Oil to Flow from the Finish Max Pro, dial the amount of spray way back and increase it until just enough spray flows to cover an area in one pass. I sprayed my entire set in less than 45 minutes, by myself:) As each piece was done, I set it in the shade and kept it out of the sun for the rest of the day. Now I can say my backyard makeover is really starting to look good! I like looking out my windows now. It’s exciting to see everything come together, and a much better feeling then having nagging thoughts about how much work I have to do! 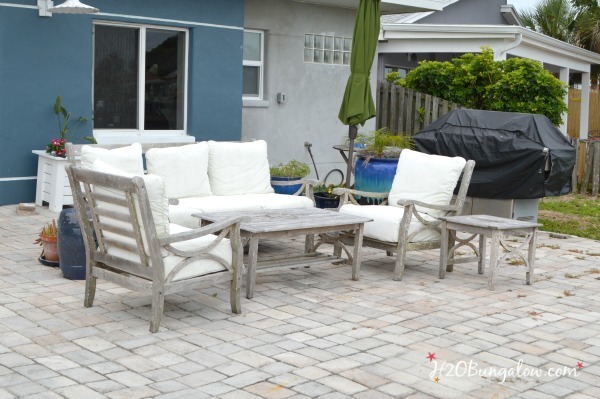 Oh, I still have plenty of work to do, it’s just that with this restore outdoor teak furniture post and project behind me, the entire backyard has turned a corner and is now starting to really look like a place to enjoy and relax in! 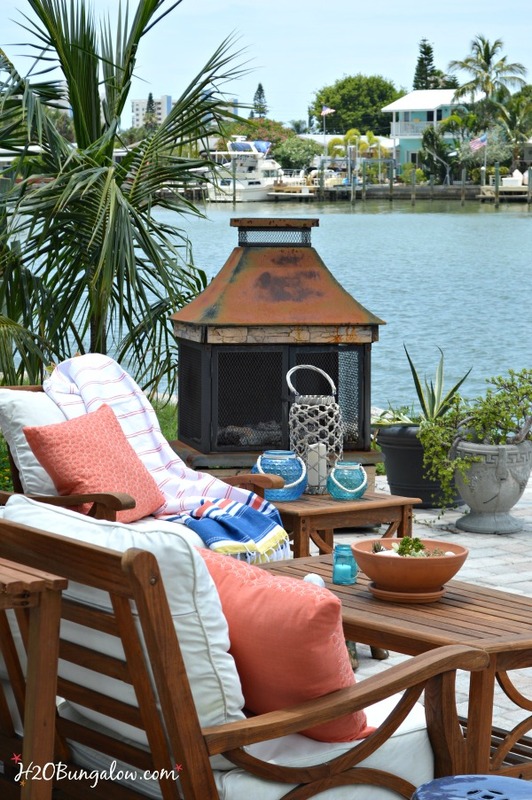 Do you have teak or outdoor wood furniture that needs a refresh or makeover? 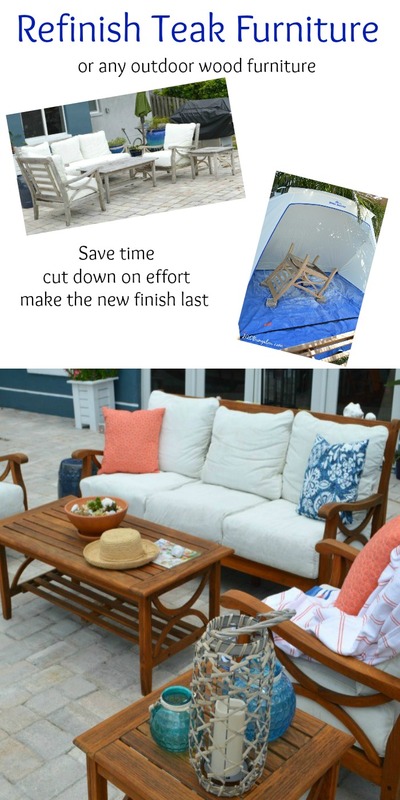 Do you have any outdoor furniture makeover tips to share? Let’s chat in the comment section below! I’m getting close to the end of my 30 Day Makeover guys! 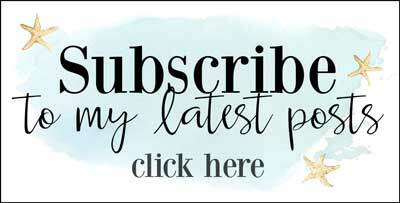 I do have a few more projects to fit into this week and I know you’re going to love them! This project was sponsored by HomeRight. 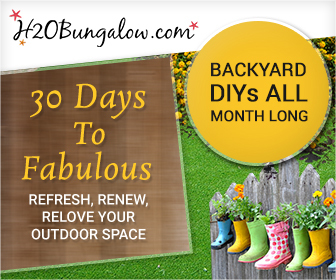 You guys know I use several of their products and love the quality and how they make my DIY jobs much easier. Did you guys know I’m also a DIY Expert on their website? How is the Timber oil holding up now? Which product do you recommend to hold for several years instead of annual refinishing? Thanks! Hi Abby, That’s a super question and timely too. I’m just getting ready to makeover my cushions and do a new updated post for the sofa set. The Timber Oil didn’t hod up as well as I would have liked it too. Both the soda table and this furniture set are exposed and out in the sun 24/7 365 days a year. The Water Seal product held up perfectly over the last year where the Timber Oil faded. I’m planning on using the Thompson’s Water Seal on the sofa set in the next month. Hope that’s helpful! I saw your makeover on Serena’s blog. Well done. I clicked over to see how you finished your teak. It looks gorgeous. We have a teak bench outdoors, and like your’s it is now grey. I’m inspired to give this a go. Hi Alys! Thank you so much for stoping over and even more for your sweet note! It was worth the work to refinish the teak. You should give it a go on your bench for sure. Now that mine has been in the sun for a month or so I was able to compare the Thompson’s Water Seal product to the Timer Oil. The Timber Oil color is beginning to fade where the Water Seal product has held up. So if you like the color of the refinished teak look and your bench is exposed to the outside weather, I’d use the water seal product. Again, thanks so much for your visit! 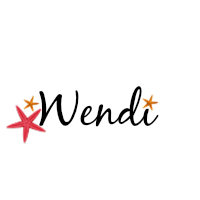 Wendi- this is wonderful advice about caring for teak. Hi Laura Thanks so much for hosting. I know how much work it is! Your furniture looks great! My next big purchase is definitely going to be a paint spayer! 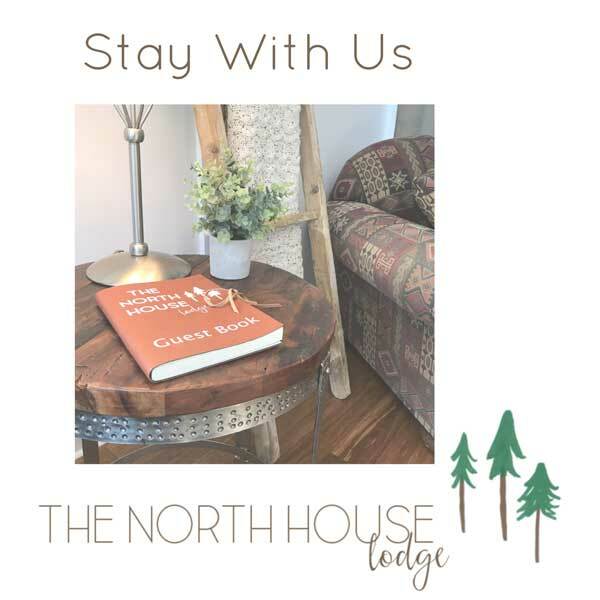 Thanks for sharing at Welcome Home Wednesdays! Oh my goodness, Wendi! Hang on while I pick my jaw off the table. What an incredible transformation! Your patio is looking gorgeous now. Thanks for linking up with Merry Monday – I’m pinning this & sharing on FB. Loved your teak furniture before but oh wow, it looks gorgeous now! Muuuuch much better definitely. Let me get this straight (I am taking notes), so: you sanded, cleaned and applied ONLY the special oil? No extra sealant? Do you think we can do this with other unpainted wooden outdoor furniture? Hi TPC! yes, that’s it. The Timber Oil seals and protects the wood, you won’t have to do anything else. 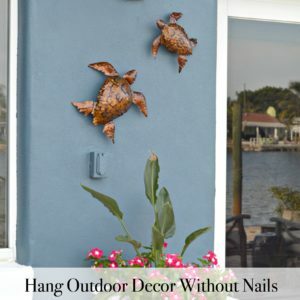 Yes, this will work on any kind of outdoor wood:) I wish I’d have know about this much earlier, I would have tackled this job a few years ago! Hope you guys are having a good 4th of July weekend! 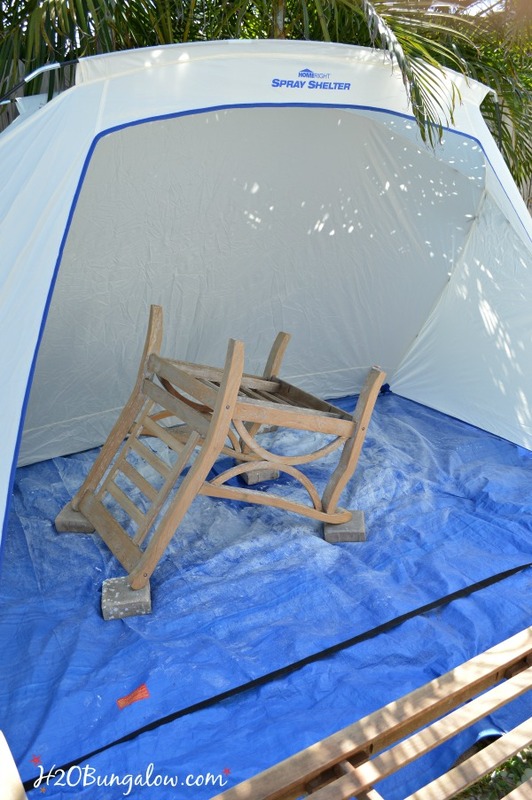 Holy Cow…that was quite an undertaking I love my homeright sprayer, but the tent…hmmm…don’t have one of those yet. 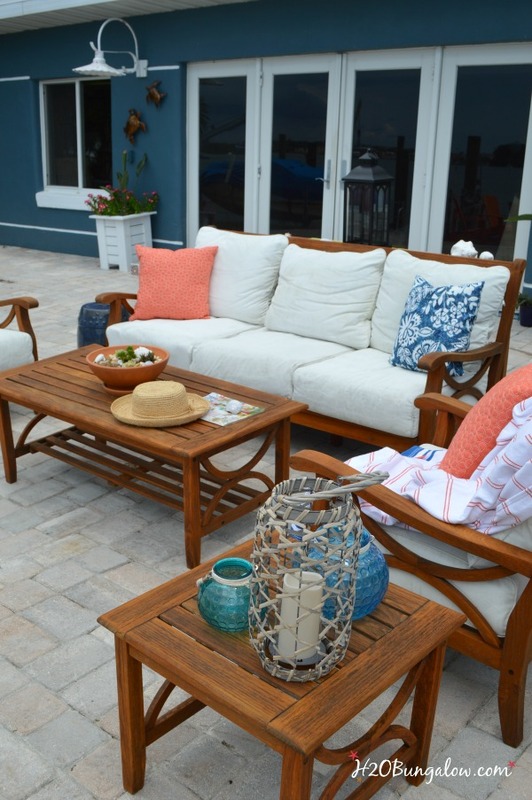 I know you just love going out to your back porch and admiring your redone furniture…and pat yourself on the back! Hi Lynn and thank you! I love my HomeRight Sprayer and the tent is a life-saver. You should have seen how I protected my areas before I had one, it was crazy! I am having fun admiring the backyard, especially since I have a few more projects left to share! That is an amazing makeover! wow! Seriously-I’m in awe. Hi Penelope & thank you! The backyard is coming along nicely! I have a few more projects to finish up before the end of the month. I can’t wait for you to see the big change! 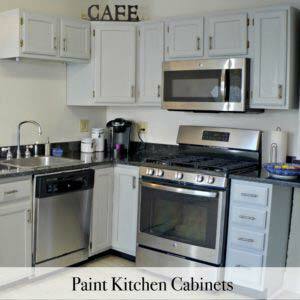 I personally love the weathered look, but I can see how it was a bit drab in your case, and LOVE the refinished look. I also had no idea there was such a thing as a spray shelter, that’s so cool! I bet it will come in handy for lots of future projects. Hi Janell! I’m so thrilled you’ve kept up with my projects! A spray shelter is a life saver for project like this. Thanks so much for the compliments..you know I’m not done yet! 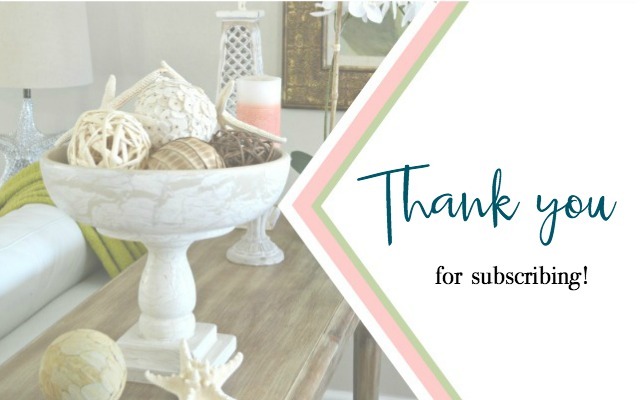 I still have a few more awesome DIY projects to share this week;) Hope you’re enjoying your summer & thanks so much for your visit! Beautiful. You have inspired me to make over my front yard. I have been wanting to get a paint sprayer for a while but I’m afraid of how hard it is to clean up. How has ur experience been with the cleaning part? Hi Kate, That’s wonderful news! 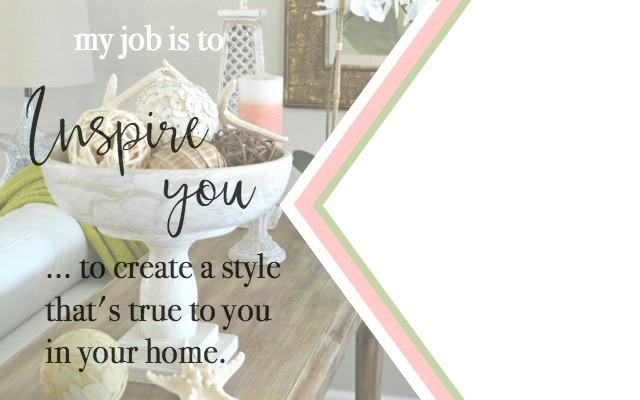 I get so excited when someone shares that I’ve motivated them to tackle a DIY! You’d love the HomeRight Paint Sprayers. They are very easy to use and clean. I linked to one of my older posts that has a video on how to use the Max Pro in this post. Let me know if you have any other questions:) Thanks so much for your visit and share a pic when you finish your yard! Wendi, your furniture looks so beautiful I love teak furniture, well actually all things teak. The wood is so warm and the graining is gorgeous. 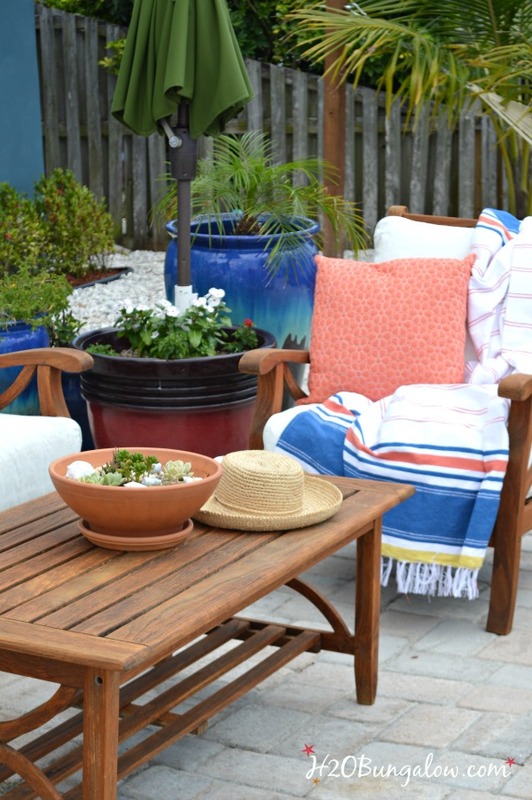 We had beautiful teak outdoor furniture in Florida, but I sold it when we moved here and I really regret it, oh well live and learn. When we first bought the furniture my husband applied Thompsons to it and every spring before we started really using it for the season he would reapply, probably overkill but when we sold it we sold it for what we paid, it still looked brand new and we had it for twelve or thirteen years. I have a picnic table That my wonderful neighbor made for me about twenty years ago and is still in great shape even after being left out in the weather for years cold, snow, ice, rain hot sun you name it. He used pressure treated wood so I guess that is why it has held up so well. I have decided I am going to sand it and stain it to look like a weathered cypress, I think that is what I want to do with it, I haven’t quite made up my mind. I have only been trying to decide now for about three years, haha. I got the brick hangers, but I haven’t hung anything yet, I will let you know how well they work. Wow, Patty! I hope mine lasts as well as yours did! We need an outdoor dining table now that I got rid of the ugly concrete one. I’m thinking teak too. How well this holds up will be the determining factor! LOL Thompsons makes other colors in the Timber Oil too, is that what you used? Send a picture when you tackle that table:) So glad you stopped by & thanks for the kudos! Wendi, I think what he used was Thompson’s water sealer, I don’t know that they had the timber oil back then, and then again they could have. Back then I didn’t do anything like that, the hubs did it all. It sure did protect it though and kept it looking new. In that hot Florida sun you have to protect the wood and you probably get some salt spray where you are located. Thanks for the info Patty, I almost used the WaterSeal product and then at the last minute I changed my mind and tried the oil. I should have used a protective something a long time ago. I guess I’m still on a learning curve for the Fl lifestyle! LOL Have a good weekend! Your refinished teak furniture looks so pretty now! I’ve been considering the idea of staining my deck this year, it’s old pressure treated wood, but I’m worried I’ll have to redo it every year once I start. Hi Vanessa, Thank you! I feel like it’s one more big step forward! I’d check with the people at Home Depot or a paint store and bring a picture of your deck. You may be able to pressure wash it or sand the top down and then treat it. A deck should last several years once treated. Teak oil just didn’t have the right protective ingredients in it. Good luck and let me know if you tackle it! Wow Wendi that wood grain really shines through. I can imagine that it must be a problem to have outdoor furniture especially since you are so near the water. This was a great solution and because it was oil it should penetrate and do a better job. You’ll have to keep us posted on this one. Hi Mary! I think it will hold up this time. It looks so much better now and yes the harsh sun and weather are awful on everything out here! I’m not quite done on the backyard yet! Can’t wait to share the next few projects! What an awesome job you have done so far!! 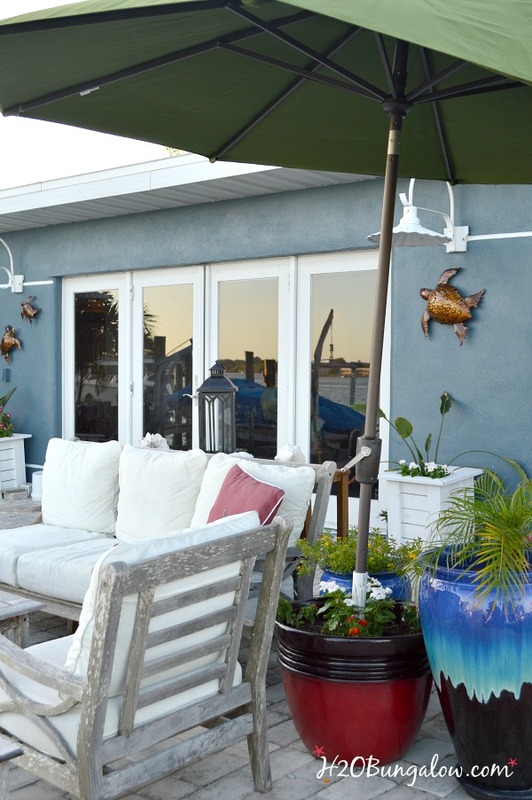 Everything is sooo professional looking & just exudes coastal living!! Good luck on your next project, looking forward to reading about it!! Hi Lynda and thank you so much! The back-yard has definitely come a very long way over the last several weeks. I’m excited about the next few projects and can’t wait to share them. Thanks so much for your visit & nice comment! Hi Morgan! Honey, if you had stayed one more day, you can bet I’d have had you out there sanding with me! Can’t wait till you come back to enjoy the newly updated back yard. Hugs! What a difference! I love your whole house, especially the view. Just the type of place I am dreaming about. Beautiful. You are an inspiration!!! Hi Julianne & thank you so much! Yes, our project house is coming along nicely…one DIY project at a time! LOL. It’s been quite the journey. I love when I get notes that I’ve inspired others. Thank so much for your note and please visit again soon 🙂 I still have a few more backyard projects to complete before the makeover is done!